Imagine, you enter your bathroom, towel in hand. You have warm, clean clothes waiting in the dryer. You’re ready for that nice, relaxing shower after a long day’s work. But low and behold, out of the corner of your eye you spot some dark spots on the baseboards behind your toilet. You squint a little thinking you might be seeing things. You convince yourself that maybe it’s just hair dye from the last time you dyed your hair. But upon closer investigation your heart sinks when you realize that your eyes aren’t playing tricks on you at all, and no, it’s not left over hair dye either. You quickly do the calculations in your head, this house is less than 10 years old. It’s way too new to have mold, you tell yourself. These things only happen in really old, decrepit houses, right? But then, deep down, reality starts to set in. In your heart of hearts, you know exactly what it is. There goes that nice relaxing shower. All you can think about now is that nasty fungus that’s taken up residence in your bathroom. You think back to the times you or your family have been sick recently, could this be the culprit? You think about your family members who have asthma. You think about all the scary things you’ve seen and heard about mold on the Dr. Oz show. If it’s here, in this room, could it be possible that there is more mold elsewhere around my house? Before you know it, your mind is spinning and you’re running around the house like a crazed lunatic examining each and every surface, terrified at what you might find. The question keeps circulating in your mind, how bad can it really be? You try to down play it in your head, to calm yourself down. But then it strikes you, that the longer you stand there staring at it, the more spores you’re breathing in. The above scenario might sound a little dramatic to some, but in all reality, it can be quite devastating to find out you have mold. I know this, because it happened to my family and I. Exactly as described, and yes, even the running around the house like a lunatic part too. In our situation however, we were very lucky, as we caught it just in time. As we later found out, it could have been much, much worse. When your face to face with what you think might be mold growing in your bathroom, it doesn’t matter how big or small an area it has consumed, that heart pumping panic really does set in. If you’re like myself and my family, you’ve probably put a lot of time, money and energy into making your home a clean, comfortable and safe environment to live. It really is a drag when that funky little fungus shows up to rain on your parade. Now, I’d be willing to bet that we have all experienced mold at one time or another throughout our lives. Most likely in the kitchen, on some expired food in our fridge or pantry. In those cases, we simply chuck the moldy food in the trash, wash our hands clean, and forget about it. No big deal, right? It’s an entirely different story however, when you’ve found evidence of mold contaminating other rooms of your house. It’s even more intimidating when you don’t know much about the stuff and you most definitely don’t know the proper steps to take to get rid of it. As with a lot of things, proper prevention is always best, but when you see those scary black spots on the wall and baseboards behind your toilet, its already too late. It’s there, and it isn’t going anywhere unless you do something about it. 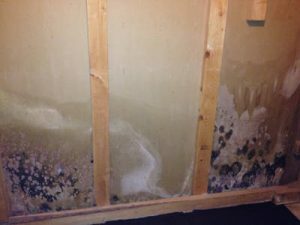 There are several types of mold, some toxic and some not. Either way, in my opinion, it’s most certainly not worth messing around with, especially when it involves the health of me and my family members. Luckily for us, we knew exactly who to call, and no, it wasn’t Ghostbusters. Instead, it was the equally good looking (and just as cool), experts from Mayken Hazmat Solutions. At the end of the day, I think their specialized equipment could rival that of the Ghostbusters anyway. Not only did they come to the rescue in a timely manner, they also brought with them some pretty impressive knowledge on mold and the entire remediation process. I know, because I asked them a million and one questions and not once did they hesitate to answer each and every one of them, no matter how minuscule or redundant my questions were. It was very evident right from the get-go that these people knew exactly what they were doing. Their knowledge and experience in this field gave us the peace of mind knowing that the job would be completed correctly. The very first step in this mold removal process was to dispose of the affected portion of the wall and baseboards behind the toilet. In order to get to that specific area, Dean from Mayken Solutions had to first remove our trusty throne. The contaminated walls and baseboards were then cut out and disposed of. Dean and his team then put their investigator hats on and found out that the cause of the mold was a leaky valve in our toilet. Wow! The damage that can be done from a simple leaky valve, and all-the-while we had no idea. It was of top priority for Dean and his crew to find the source of the problem and fix it. And I mean really fix it, not just put a band aid over it. This truly made us feel like we were in good hands and that we made the right decision by calling Ghostb…uh, I mean, Mayken. I’m not going to lie, at first it was a little scary seeing our bathroom in such disarray, but the job was done quickly, efficiently and every ounce of dust was cleaned up in the process. We didn’t have to worry about how or where the mold would be disposed of, as the folks at Mayken had this completely covered. They were very careful to contain the mold in such a way that it would not cross contaminate other areas of our home. They deal with hazardous material on a daily basis so thankfully for us, we did not have to worry about this aspect of things. My not-so-extensive knowledge (from watching Dr. Oz and googling web MD), was that when mold is disturbed it sends out these teeny tiny pesky little mold spores into the air to wreak havoc. Especially on people with breathing and immune related issues. This knowledge did nothing but increase my anxiety as we have a couple family members who suffer from asthma. Mayken took my thoughts and feelings about this into consideration and when working to remove the mold they did not take this lightly. I sat back and watched as a massive fan-like piece of equipment was brought into our house. Even though Dean from Mayken advised us that we had nothing to worry about, we were still concerned there might be spores in the air. He was extremely kind and understanding of our concerns and left the fan with us for extra couple days just to put our minds at ease. After the remediation process was complete, our bathroom was put back together even better than it was initially when the house was built. Dean even went the extra mile to re-install our toilet paper holder that had broken off the wall in my “running around the house like a crazed lunatic” episode. He also took the time to color match the paint on the walls and baseboards for us during the restoration process. Pretty impressive if you ask me. The crew at Mayken treated our home with the utmost respect. When dealing with these or other such issues, the last thing you want to worry about is who is coming into your home, and how will they treat it. From the initial evaluation to the final air quality tests, they took the time to keep us informed and more importantly, provided us with the most effective yet economical solution for our situation. Check out this article to learn more about mold prevention. For more information on MayKen’s mold removal and restoration services CLICK HERE. Feel free to CONTACT US TODAY to ask us any questions you may have about mold.